Raise your eyes skywards and you’ll see some of the most spectacular multi-level residential leisure zones ever offered in Sydney. Extraordinary in their scope and scale, this is the setting for the exclusive residents-only amenity of Esplanade Club. 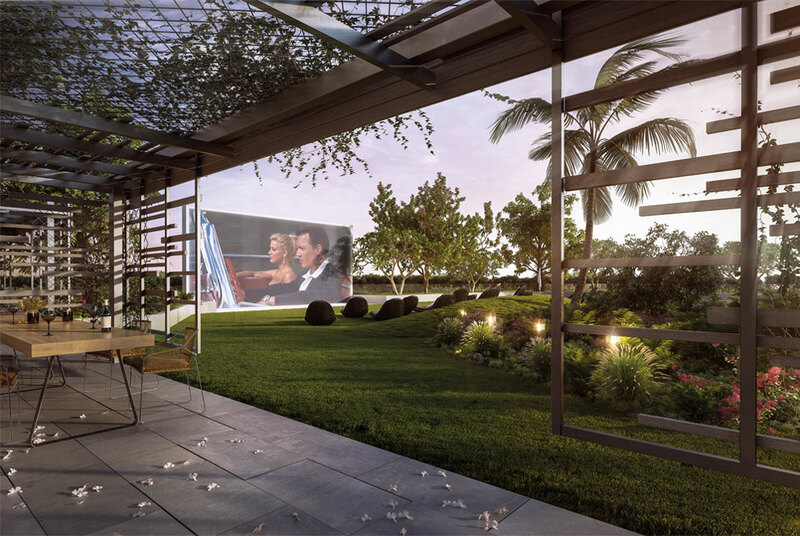 Here you’ll find an incredible garden cinema set amidst emerald green lawns. There are dining pavilions, sunset cabanas and scenic chill-out spaces for retreat entwined with dense rainforest planting, swaying palms and reflection pools. Wander through lush gardens and soak up the views. Rise early for morning yoga overlooking the lake. Fire up the grills for a weekend barbecue, or pull up a pew on the grass to watch movies under the stars. Sydney’s sub-tropical weather and endless sunshine serve as inspiration for these truly uplifting podium landscapes. You can even get in a couple of holes on the mini putting green or raise your heartbeat on the outdoor gym circuit. Immerse yourself and feel transformed by Esplanade Club’s oasis vision of leisurely lakeside beauty. It’s yours to experience and enjoy each and every day.